This is the Frequency Blend brought to you by Intelligentsia Coffee. 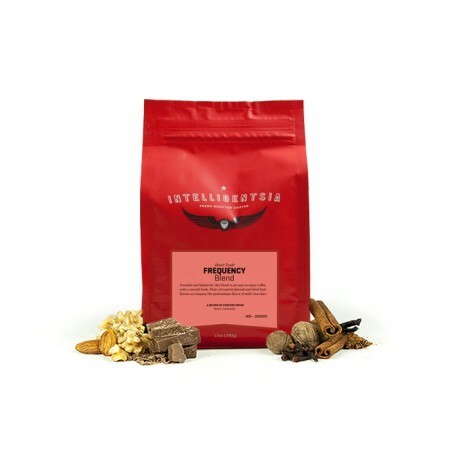 This coffee is a blend of high grown coffees from El Salvador and Brazil. Versatile and balanced, this blend is an easy-to-enjoy coffee with a smooth body. Hints of toasted almond and dried fruits accompany the predominant flavor of milk chocolate. This coffee is smooth and pretty good. It is rather unremarkable, however. Good. A little acidic. Not as good as the Kickapoo drifess. Looking to see if the next pot brews similarly. I liked it as a morning coffee. I loved this roast. It has an amazing flavor that I like from my lighter roasts. Plus, I feel like it packed a nice kick of creative energy. Amazing, I love the after taste, I would definitely buy. No bitter acid or over charred flavor. I nice blend of sweetness and nuttiness. Smelled amazing, a bit bitter though. I think from living in Chicago and going to Intelligentsia I'm biased but this was really good. Easy to drink but had a full body flavor. Liked the hints of dried fruit. Was a bit too light of a roast for my taste, but I enjoyed it. This was good. I liked this one. Although this was an excellent coffee, since we live in Chicago we were hoping to experience a selection from a roaster that we couldn't get from the grocery store down the street. That said, very easy drinking and enjoyable. Good but not bold enough. Really enjoyed this blend more than I usually like blends. I could taste all the flavor notes. A great drinkable coffee. Tasted good ,but could be a little more bold. Tasted good and was a bit bolder/darker than Anodyne. Could be a bit darker. Again, garbage. What’s the point of sending these out? Unsealed bags with oxidized coffee. Flat, flavorless, and stale. Is this what’s to expect? Decent. On the right track. This one was good. It wasn’t my favorite. However, we took it with us on vacation and was brewing it in a coffee pot that could grind and brew all in one, and the pot didn’t get cleaned very often from other coffee. I’m wondering if it affected the flavor. I wouldn’t mind trying this one again. Terrible. I asked for dark roast espresso with a preference for Arabica and no South American. Do you even listen? We found it overly acidic and winey, like we do all Third Wave coffee. This is why we have sent you numerous notes asking you to confirm that our preferred roast range is FULL CITY to VIENNA. Please confirm! I actually liked this one better than the Anondyne blend. It was pretty tasty. I thought it was pretty good. I was worried I wouldn’t like it because it says it has “dried fruit” notes. But I actually didn’t mind it and found that the other flavors came through more strongly. I liked the flavor too. Good tasting, strong enough. Second cup held its flavor. This coffee was a bit too sweet for my tastes. Chocolate and raisins. Decent cup of coffee, but not my favorite. One of the better light-medium blend's we've tried! lighter in color than I am used to once brewed. Not bitter, had the smmoth finish I prefer. Not overly aromatic, or flavorful. Light color. Seems like a generic cup of coffee. Not as crazy with the fruity flavors. I liked this more than the Anodyne House Blend. This was a bit bolder. Also, I was worried that the dried fruit would be overwhelming, but it was just enough to add some interest without making me feel like I was drinking tea. While not nearly as bad as Anodyne House Blend, it's mediocre at best. too lightly roasted, but not raw. Some chocolate, no fruit, some body. I wouldn't buy it again or recommend it to anyone. Too light. Not my cup of coffee. Full bodied and wonderful, probably a bit better for winter than summer. Delicious. It's ok nothing special. Decent cup of coffee. It was too light for me. I like stronger coffees because I brew them either through a French Press or a moka stove-top espresso. Not as much of a morning kickstart as I’m used to. This is a light roast with higher acidity. It’s much too bright for my taste. To say this is full bodied is a stretch. May be fine for folks who like light roast but this was a waste of my first shipment. Disappointed this was picked as I specifically noted dark roasts as my preference. Smooth, mild, somewhat fruity taste. Again, I would probably prefer a somewhat darker roast. Did not have much flavor. Would not buy this again. Also ok, maybe a little better than the Anodyne. Also a little sour. I like this coffee a lot. I tasted chocolate and dried fruit like apricots. Smooth and balanced but kinda bland. Didn't bloom much so I wondered about freshness. Did a pour over and tweeked the grind a bit, but will try a longer brew in the Clever. Coffee didn’t taste as fresh as I was expecting and came in an open bag. Not sure if that was the intent. It still had some of the milk chocolate flavor but lacked the enjoyable and strong coffe smell right after being ground. I brewed this the same way I brew all coffees, cone filter, fine ground. The result was a thin, watery, like the 2nd or 3rd use of medium or light beans. Could not finish the 1st cup. The beans were tan, not brown as if not fully roasted. This coffee was not one that stood out in anyway. It’s not a bad coffee, just not something I would seek out. 7.5/10. Very smooth and easy to drink. Bold on the front end, but light and airy in the back of the mouth so a nice transition from first sip to back of throat. Brewed on a chemex with paper filter so little to no acid. Heavy in fruit/dried fruit flavors especially in the middle of the mouth. Could certainly be more complex in flavor - seemed weak and watery despite normal 1/16.6 ratio. A good cup of coffee. Not as good as some of the others I have tried. Not a very big fan of this one. It has an almost tea like flavore to it and seems a little bland. This was in the gift box set given to me with no roast date or any other markings. Assuming it was old or sitting on a shelf for awhile, cause out of the bag it smelled/tasted pretty stale. Unfortunate. My preference is more floral/fruity light roasts and this definitely wasn't that, which is fine, it lived up to it's description but just not good in my opinion. Similar to the Anodyne. Lacked a usual bloom in the Kalita. More heavy on the chocolate profile for my liking (though I'm a big fan of their single origins). This coffee is a bit light for me and the fruit notes were rather pronounced. It was interesting, but I prefer a bolder but smooth taste. This was a good coffee but Intelligentsia is served at a few coffee houses near me. Prefer not to have this brand. This one was okay, but sometimes I get that "sour" or bitter taste - so might be my brewing of it. This was okay. It didn't make me wretch like the Anodyne House Blend. I'd really like to actually get single origin coffees like I requested in the future. Unbelievable scent. Great round flavor. Liked more than the anodyne, Smoother and more chocolate-y. Pretty good, not as good as others I’ve had. Not bad! A little fruitier than I would normally drink. A little bit too light for me, good flavor, should have gone French Press on this. Really enjoyed this coffee. Felt like I liked the flavor of this one more than the Verve 1950, but less than the Onyx Sugar Skull. Enjoyed the dried fruit notes. really liked this one too. I have had this one before. The Anodyne seemed to have a bit more complexity to it, but I think the smooth chocolate taste was better on this one. We liked the Anodyne better because it had more personality. This blend was really really good, but wasn't our absolute favorite. We are interested in trying more of Intelligentsia's offerings though! Good taste and the chocolate came out nicely. This is a solid coffee with good body and acidity. I like the roast level on it. More of the fruit and floral notes come through with a good backing of cocoa. The flavor profile is more delicate, it is overwhelmed by milk, but I really like this coffee. A little thin. Clearly a standard of higher end coffee but to me had a slightly sour undernote. I didn't care for this one, I think it was too light and almost sour for my taste. I know I initially requested lighter roasts, but I would be interested in trying some darker ones in the next shipment! Love the balance of this coffee. too light for my taste and very flat body. tried about 4 different grind consistencies to get the correct flavor to come out, and i use a moccamaster drip so there is no variation in brewing, and still got no worthwhile results. This was a very solid coffee. Well balanced and very good with several brew methods. This one was really interesting. The fruit notes were really pronounced which was fun, but we both felt the roast was too light and this tasted more like a great tea than what we like in coffee. Good, but not what we want for our morning brew. I really liked this one! I could taste the chocolate flavors come through. It was even better iced! A little sharper than we normally like, almost like a darker roast that wasn’t as sweet/nutty as we like. Very boring and simple coffee. Did not taste most of the flavors in this coffee. Loved this coffee. Very rich. Had a bit of a sour finish - prefer mine to be a bit more bitter. Not a dark roast or anything I like. Good quality coffee, but I prefer bolder flavor with less acidity and a darker roast. Great coffee. A little lighter roast than I prefer. Was a fan of the complex flavors. It wasn't that I didn't like this coffee, but I had a hard time brewing it. The coffee almost formed a brick so that the water wouldn't seep through. I've never had this experience with any coffee before. Very light bodied. Personally too light on flavor. Good body, reasonably rich flavors; a chalky-slightly sour flavor develops as the coffee cools. Somewhat full bodied but still prefer something fuller bodied. I did not like this at all. The coffee was not fresh (it did not feel like fresh). Perhaps my request was misleading. I like coffees like Philz (Tessora) and Pete's (House Blend). I could taste the fruit and did not like it. Darker roasts please. This was not the greatest tasting coffee. I removed the “chocolate” from my profile since both of the ones I received were “chocolate” flavors and tbey weren’t my favorites. Especially since I make them in my espresso machine. This coffee was just ok, nowhere near the Anodyne House Blend. To weak. Not bold enough. I liked this one. Good, balanced flavor. Not too light but not too strong. Liked it a lot! Just leaving room for improvement. I enjoy a darker roast. Would you please send a coffee similar to a dark roast Sumatra for the next shipment? Thank you. Not freshly roasted. Roast is too dark. If you can’t source beans that have been roasted within 96 hours of home delivery (and preferably closer to 72 hours) you’ll never be able to truly compete with the local coffee roaster who has its beans for sale at the Whole Foods down the street within 48 hours of roasting (sometimes 24). If you want to have any chance of keeping me as a subscriber after this gift period expires,please send the freshest light roasted beans you can source. This had a strange flavor that I really didn't like. Maybe it was the dried fruit? It tasted almost herbal. Acidic notes too bright for me. Not enough body for me. Just didnt seem robust enough, perhaps a little too light. Not as much a fan of milk chocolate (it was good but not great). Still enjoyed it however. This was fine but not particularly memorable. Taste not appealing to me. Very light and pleasant all-around, enjoyed the chocolate/almond notes. A little bit too light but the tasting notes we good. Extremely flavorful blend, my favorite by far. Smooth cup of coffee. Low acidity with pleasant body. Very good. Made with French-press and Chemex. Too mild. May use for an after dinner coffee with dessert. But still not my style. I like French or Italian roasts! Bold and Smokey! So tasty and great flavor and smells. Description was spot on. I really enjoyed the balanced, smooth flavor of this coffee. Maybe it was the combination of almond, chocolate and fruit, but it was a delicious grouping. Are 3 cups of coffee in a row too many? I tried this coffee using a V60 and thought it was just okay. I was really hopeful for a more balanced cup of coffee. Thankfully, the acidity was not overwhelming like the Anodyne House Blend. I'm looking forward to trying a few different methods to see if I can coach out the best way to brew this coffee. Similar to the Anodyne house blend. Very smooth and easy to drink. The Anodyne seemed to have a little more body than the Frequency blend. Haven’t tasted it yet, but dont care for the taste of chocolate in my coffee. Nice dried fruit (raisin,currant) notes, but this coffee was also kind of flat and partially staled. While I am a fan of several of Intelligentsia's single origin offerings, I found this blend pretty lackluster. Exceptionally smooth and balanced, but a little boring. Didn't really get the almond or fruit flavors- just overwhelmed by the chocolate. Smooth and balanced. Lighter taste than what I typically prefer. A little too mild in flavor for my taste. I found this blend really nice and understated. It worked well in both my chemex and aeropress. I thought it performed especially well when brewed as an iced coffee. I didn't perceive the dried fruit, but enjoyed the chocolate and nutty notes. A great, full bodied blend if you like a nutty coffee. Also tasted closer to a medium roast than a light roast in my opinion. Very much an "easy-to-enjoy" coffee here. Your basic nut, chocolate, and maybe even dried fruit notes are present. My roommate, a dark roast drinker, enjoyed this coffee. Unfortunately, for myself, someone that doesn't necessarily consider himself a light roast drinker, did not take to this coffee. I was hoping for something a bit more complex, more stone fruit notes, and something that was the opposite of what you would expect from a traditional coffee. Will keep trying! Really smooth drinking. Enjoying this one a lot! Also love the packaging with the nice seal on the bag.